DTGD11 Are you playing in the Dirt this week? You should be! It’s been Dare to Get Dirty Challenge week all week long on Splitcoast and there’s still time to play along. Come on, wouldn’t you love to play in the dirt pile with some of the Dirty Dozen current and Alumni? Take the challenge! Last year, I hosted a couple of challenges, but this year I provided some samples for a couple of the challenges. This card is for Karen Barber’s DTGD11 challenge for 8/5/11. You can read all about it HERE, but you’ll need to be a Fan Club member. So I won’t tell you what the challenge is, but I will tell you a bit about the card. All images are Sparkle N Sprinkle. I just love these art deco images and I couldn’t decide which to use, so I used all three. There is one more on the sheet, but I think I worked as many in as I could, lol. They were all stamped, colored w/ markers and cut out. I added a little sparkle w/ some fire engine red glitter just in a few places. The frames on the red layer and the turquoise layer are actually much smaller but I used a stamp positioner to extend them and added some highlights w/ a white gel pen. The sentiment was die cut w/ a ribbon tag then I trimmed off the ends of the tag. The finished card measures 4.25 x 5.5. 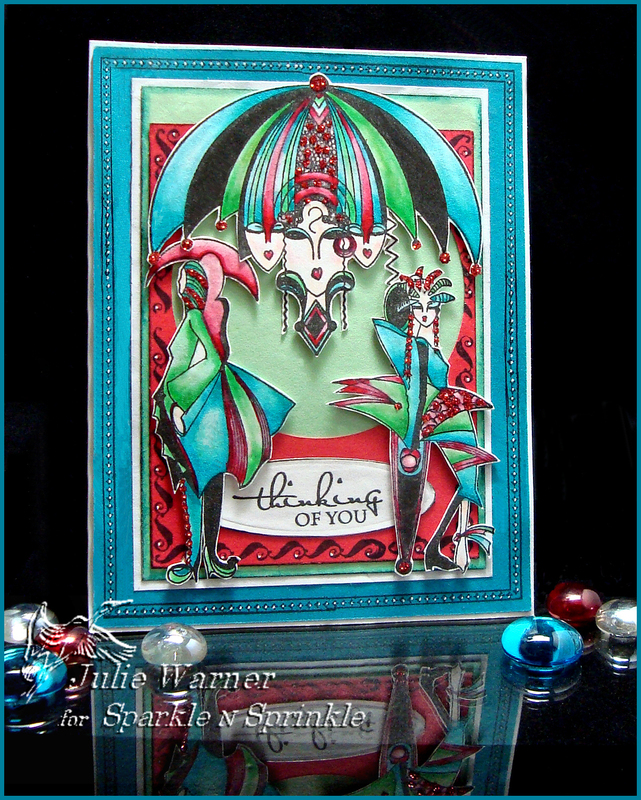 While I’m on the DTGD challenges, here is another sample card I made for Suzanne Dean’s DTGD challenge on 8/3/11. I promised to post it here, then totally forgot. It also features images by Sparkle N Sprinkle. For this one, I stamped the fall image twice on water color paper w/o reinking. 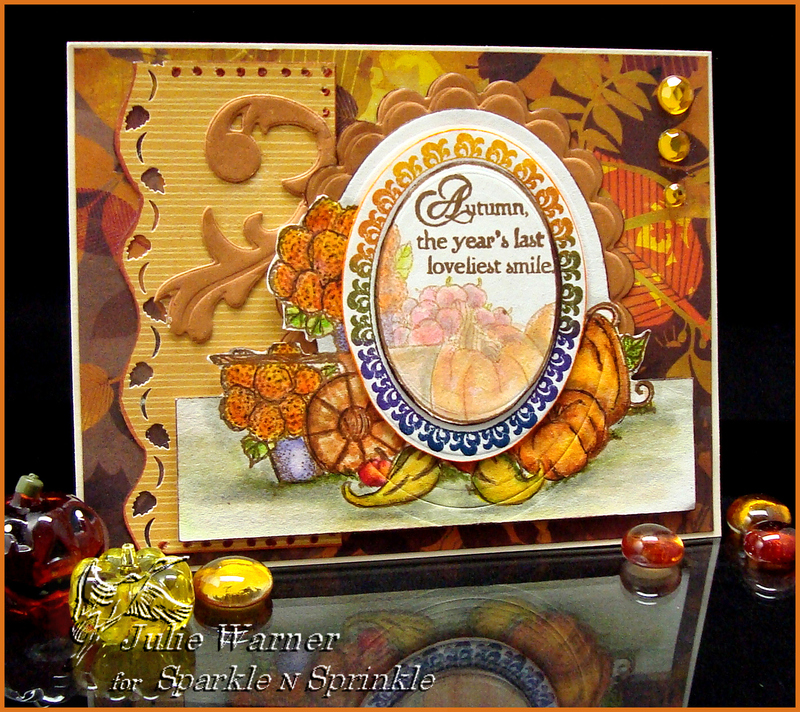 I used the fainter image for my inside oval and stamped the greeting above it. I used the largest oval die to cut just the top and went out of the box for the rest. The center oval was stamped w/ the frame using the Kpad.The strip down the left side was punched and pierced and a little flourish was added behind the butterscotch colored scallop oval. The finished card measures 5.5 x 4.25. Thanks so much for stopping by! Besides being a lot of fun, there are some serious prizes involved if you participate in the DTGD challenges. So check it out!